Louis Hartnoll reports on a talk given by David Teh, Assistant Professor at the National University of Singapore, on 22 June 2017 at Tate Modern. The world map has shrunk. The social and geopolitical distance between cites has contracted. Although cross-referencing spatial coordinates might tell one story, the ‘neoliberal poetics of networks’ reassures us of another.1 As the narrative so often runs, with the ideological and material dominance of globalised capital the relevance of the nation-state has been surpassed. Anointing the age of global social interconnectedness, the organising principle we must now turn to is the transnational. But if this is true, does the nation have a function today? It is as ethereal as the discourse seems to suggest? Presented within a series of investigations by Tate Research Centre: Asia into transnationalism and artistic practice, the opening gambit of David Teh’s presentation was to suggest that the move from the national to the transnational was not as effortless as it may seem. What the lens of transnationalism obscures are the immediate and continuing political pressures that the nation-states place on their citizens. How is it possible, within such frames, to comprehend the historical and continuing ‘demands of the nation’ as they are impressed upon the students, artists and critics constitutive of a nationally-delineated culture? any critical articulation of this trans- must attend, first, to the national and to the international. That a history of contemporary art must, in other words, be both a history of that transnational interchange and a history of what it has meant in given times and places to be international. not only is it a place where nation has been preponderant […] in theory and in practice, in the institution and the conceptualisation of modern art since the 1930s. But also, because its contemporary artists have been, by non-Western standards certainly and especially by Southeast Asian ones, uncommonly mobile and successful in transnational circulation. For Thai artists [although, as was subsequently pointed out, this figure is a markedly and admittedly gendered and classed one – LH], ways of being and feeling mobile and international, or exploiting distance, far from indicating a global, nomadic subjectivity, are on the contrary closely circumscribed by their national experience and cultural inheritance. Moving in parallel to the third chapter of his recent book, Thai Art: Currencies of the Contemporary (2017), Teh’s presentation was broken down into three sections. The first, ‘Roundtrips: Mobility and Artistic Formation’ sought to define the contrasting modernist and contemporary models of artistic mobility. The second, ‘Nirat: Homesickness as a Spatial and Cultural Logic’, attempted to trace a culturally-specific concept of distance and mobility as prefigured in nineteenth-century Siamese culture. The third, ‘Currencies of Distance in Thai Contemporary Art’, concluded by considering the role distance plays in Thai contemporary art. While distance and mobility are, as Teh terms it, an ‘artistic currency’ typically figured through reference to globalised conditions, perhaps the central thesis that this paper argued for was that they are equally conditioned by local and national histories. If contemporary art has entered into an irreversible period of international circulation, it was the events of 1989 that marked this threshold – including, most obviously, the collapse of the Berlin Wall, the Eastern European uprisings and early signs that the Warsaw Pact was set to dissolve, the Tiananmen Square protests and the seeming ideological ‘triumph’ of capital. Since that point, many of the political flashpoints and their theoretical interpretations have been framed by themes of ‘globalisation, […] rapid urbanisation, the neoliberal poetics of networks and, above all, the prodigious mobility of labour, ideas and capital’. Contemporary art has, in turn, been perceived to occupy a privileged spot within this interconnectedness, with the artist’s nomadic mobility figured as the instance par excellence. But, as Teh argues, this familiar narrative of the historically-mediated conditions of art’s global circulation, must also be inflected with a historically-, culturally- and geographically-mediated understanding of mobility itself. As Teh claims, the first instance of mobility to enter into professionalised Siamese visual art comes with the figure of the Italian sculptor Corrado Feroci and the forming of the rongrien praneetsilpakam (School of Fine Arts, Bangkok now known as Silpakorn University) in 1933 – an event that operates in tandem with and in the wake of the 1932 Siamese revolution and the overturning of its system of absolute monarchy. As Feroci’s first cohort of students function to demonstrate, international travel, study and exposure became an ever-more constitutive feature of artistic professionalization. What they signalled were the marks of national and classed distinction. As the conditions of mobility proliferated throughout the mid-twentieth century, it was Inson Wongsam, a student of Feroci, who emerged as the ‘arch adventurer modernist’. In 1962, Inson undertook his quasi-mythologised journey: travelling via and exhibiting in Dehli, Kerrarchi, Tehran, Istanbul and Vienna, studying at the École nationale supérieure des Arts Décoratifs, Paris and then crossing the Atlantic to go to the US before returning to Thailand in 1974. What ultimately characterises and defines this journey is that its professional and terminal destination was, in effect, his starting point. As Teh terms it, his journey was a ‘round trip’. The first Thai artist Teh identifies to have worked within this circulatory model was Montien Boonma. After studying in Paris, he took a teaching position at Chiang Mai University (CMU) in 1989. Linked to Navin as an ajaan of CMU and the ‘driving force’ behind CMSI,2 Montien was one of the first Thai artists to achieve significant international recognition. Having exhibited extensively on several international platforms in the early 1990s, his rhythm set the pace. ‘For those that followed’, Teh proposes, ‘sustained itinerancy became the norm’. Distance, then, had transformed from mark of distinction to condition of professional necessity; as Teh notes, the ‘most successful [Thai artists] have been the most mobile’. Within this model, the generational shift that begins to occur turns away from the national and towards the international as the primary index for professional accreditation. But what this shift signifies for distance and mobility must also be read within the historic context of pre-modern Siamese cultural forms. Deploying Thongchai Winichakul’s arguments in Siam Mapped (1988), Teh contends that it is only in light of Siamese historic understanding of space that the significance of the specific cultural logic of the universal concept of distance becomes fully intelligible. Via a short detour through traditional, narrative Siamese cartography, it is in the field of literature in general, and the nirat in particular, that Teh settles. As a singular and informative precursor, the nirat is an early-modern form of Siamese poetry that merges the love poem with the long-form travelogue. Forged out of an entrenching capitalist grip on Siam and accompanied by an emerging bourgeois demand for non-courtly, descriptive literature, the nirat emerges as the ‘defining genre of a new era of mobility’. This mobility, however, was neither that of the colonial adventurer nor imperial explorer. What in many ways characterises the nirat, Teh indicates, is that the subject penning it and the themes underpinning it are that of the ‘misery of the homesick traveller’. The poets yearn and mourn. Shot through with the promise of return, the nirat is addressed neither scholar nor court, but to their absent and ‘distant lover’. Writing in the early- to mid- nineteenth century, Sunthorn Phu occupies one of the most prominent positions in history of the nirat’s development. What is here significant about Sunthorn, Teh argues, is that his poems beat to the drum of the burgeoning bourgeoisie. In its contents and its cadence, Sunthorn’s work traces the historical shifts in social structures that Siam was experiencing. In distinction from court literature, constituted by ‘arcane literature and foreign vocabulary’ and concerned with ‘the celestial sphere and royal eulogies’, Sunthorn’s work was predicated on the aspiration and demands of a non-courtly language and thematics. Citing the contemporary scholarship of Rosalind Morris, Teh advances that such poetry tracked the socio-ontological constitution of an emerging Siamese subjectivity and their transformed relationship to distance and separation. That is, situated ‘between protagonist and narrator’, the nirat’s authors give the concepts of distance and separation a modern, spatial inflection. ‘The nirat is born of a temporary displacement’. The author’s movement ‘directed, inexorable and always with a view to return’. In essence, a roundtrip. With passing reference to Kamin Lertchaiprasert, it is to Rirkrit Tiravanija that Teh turns for an indication of an attuned redefinition of professional itinerancy and the idiom of homesickness. As with Navin, it is here not the roundtrip but the subtle ‘orbital’ movement that defines the function of and relation to distance co-constituting his artistic practice. Rikrit’s biography can be coloured by nothing other than international diplomacy: born in Argentina Rikrit was raised in Thailand, Malaysia and Ethiopia before settling and making an artistic career in North America. Based across New York, Berlin, Bangkok and Chiang Mai, in the years running from 1994 to 2004 Rikrit produced no less than 60 solo exhibitions in 14 countries, and participated in no less than 16 biennales in 12 countries. Although lacking the yearning sentimentality typically characteristic of a nirat, Teh outlines, it is Rikrit’s transpositions of his New York apartment – such as Untitled, (Tomorrow is Another Day) 1996 and Untitled, (Tomorrow Can Shut Up and Go Away) 1999– that appear to have escaped the homesickness that may define why he appears so mythic to a younger generation of Thai artists. ‘But the formal operation is unmistakable: a literal projection of home onto the foreign landscapes of an orbital itinerary’. If distance operates at the level of narrative, then international circulation hovers at the level of professionalisation. Although this turns up in the work of two prominent artists – Pratchaya Phinthong’s exhibition ‘Missing Objects’ at the Chulalongkorn University Art Center 2005 and Arin Rungjang’s work Russamee Rungjang 2009 or Unequal Exchange: No Exchange Can Be Unequal2011 – it is with one figure, perhaps even the figure, that this is most evident: Apichatpong Weerasethakul. Indeed, Apichatpong may be the case in point for arguing, Teh suggests, that ‘[global] mobility might give national belonging a new currency’. Despite his quick adoption by international cultural scene – having studied at the School of the Art Institute of Chicago (SAIC), gained substantial recognition at the Cannes Film Festival and exhibited on major platforms such as Documenta, the Istanbul, Liverpool, Sharjah and Sydney biennials, to name but a few – Apichatpong’s recent (not early) practice is ‘uncommonly rooted in Thailand’. The most compelling argument for this thesis is shown in the objects and structures of Apichatpong’s films. Somewhat notably, epistolary distance is at the centre of his 1994 work 0116643225059 and the short film A Letter to Uncle Boonmee 2009. Also present in works such as Unknown Forces 2007 and Mobile Men 2008 is the classed and racialised motif of Thai transport workers, users and their infrastructures. The subjects of these works are ‘the mobile men and women at the barricades in the political standoffs that followed the army’s overthrow of populist premier Thaksin Shinawatra in 2006’. But perhaps the most singular example of these concerns are found in his feature-length film Mysterious Object at Noon (2000) – developed out of his MFA thesis at SAIC. Teh contends that in using his ‘distinctive, psychogeographic approach’, and although this work oscillates between documentary and fiction and resists the three pillars of Thai cultural heritage (nation, institutional Buddhism and monarchy), it nevertheless remains within realm of the nirat. Not unlike Sunthorn Phu, what Apichatpong hopes to trace in this work is the shifting class structure, notating the rhythm of those workers forced to occupy the marginalised base of capitalist society. Unlike Sunthorn Phu, Apichatpong does not dismiss the working-class country folk he encounters, but casts them as the protagonists of his films. Teh concluded the presentation by arguing that as the grip of institutes of the artistic modern diminish, contemporary Thai artists have turned ‘to the peripheries for counter-hegemonic resources’. As Apichatpong serves to demonstrate, the materials upon which this is built are the tales of the buried, transient or marginalised lumpenproletariat. The tool of narration, aside from symbolism or representation, enables these works’ critical dimension in the post-1989 age of global social interconnectedness. For although ‘the nirat predates the world-view called “national”, it’s perhaps precisely this pre-national dimension that has made it such a fertile model for contemporary global artists’. To the globalised demands of capital and Western modernity, Thailand has often presented uncomfortable resistance. Thai conceptions of space, distance and mobility are one key instance of this. Within the history of cultural forms, the ‘contemporary nirat refreshes the ambivalence of narrative and frustrates the supposed universality of modernity’. A full recording of this event is available upon request. Click to email for further details. 1. Unless otherwise specified, all quotes are taken from David Teh’s presentation ‘Transnationalism and its Limits: Mobility and Contemporaneity in Thai Art’, 22 June 2017. 2. Gridthiya Gaweewong, ‘Introduction: Why Montien Boonma now?’, ArtAsiaPacific, July/August 2014. Available from: http://artasiapacific.com/Magazine/89/DearestMontien, accessed 20 July 2017. 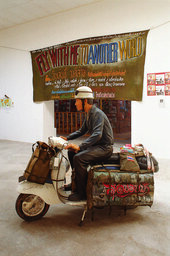 ‘Transnationalism and its Limits: Mobility and Contemporaneity in Thai Art’, Tate Research Publication, 2018, https://www.tate.org.uk/research/research-centres/tate-research-centre-asia/event-report-transnationalism-and-its-limits, accessed 21 April 2019.